A whole range of medical procedures rely on lasers, so much so that we don't even realise we're being treated using Light Amplification by Stimulated Emission of Radiation (LASER). A bit short-sighted? How about laser eye surgery to correct your vision? Got a birthmark you want removed? Then laser therapy will do the job. And in the future, doctors say laser-based treatment will revolutionise cancer care and save the NHS money. So what are lasers? They are concentrated beams of light travelling in a particular direction. What makes them different from a normal light source is that the light waves are all travelling in harmony with one another, and they are usually of one wavelength or colour. When all these properties are reflected back and forth through a special material, the result is an amplified light source, or laser. "It's a remarkable light source, a billion times better than a normal light source," says Professor David Hanna from the Optoelectronics Research Centre at Southampton University. A laser can do just about anything, he says, and most people just don't realise how many of them are working out there, quietly transforming our lives with their "unending capability". Theodor Maiman was the man behind the first working laser, built in 1960. Just one year later it was being applied in a medical procedure at an American hospital, where a ruby laser was used to destroy an eye tumour. Today lasers are commonly used in most medical disciplines, including dermatology, dentistry, cardiology, neurosurgery and eye surgery. The advantage of lasers is their ability to deliver high precision treatments, without the need for invasive surgery. Laser eye surgery to correct vision, for example, has become a common procedure. 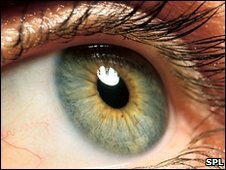 Doctors use a laser to permanently change the shape of the cornea, which is the clear covering over the coloured iris. They also re-shape the lens of the eye, which is just behind the pupil. More than 100,000 of these procedures are now performed every year in the UK and that figure is on the increase. Laser therapy to remove tattoos and birthmarks is also used regularly. The laser works by breaking down the barrier which protects the tattoo pigment or mark and allows it to be removed naturally by the body's own defences. Lasers have been used for over 20 years to treat some cancers. Photodynamic therapy uses a drug to make cancer cells more sensitive to light. When a laser is directed at the area of the cancer, the drug is activated and the cancer cells are destroyed. This type of laser therapy is mostly used on skin cancers but has also been used to treat brain cancers. Doctors say the advantage of photodynamic therapy is that there are no unwanted side effects, unlike chemotherapy, and it's possible to use it more than once. Radiotherapy, on the other hand, cannot be repeated. In the last five or six years technology has improved so much that lots of different hospitals now offer this form of cancer treatment - but it's not suitable for every type of cancer. Looking to the future, Professor Harry Moseley, head of the photobiology unit at the University of Dundee, says diagnostics is an exciting area in which lasers will play a major role. "We are shining laser light at areas of the body to see what reaction we get. 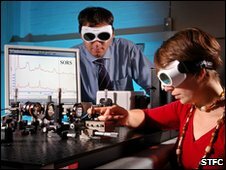 Lasers can tell us if there's a cancer there because of subtle changes in what's reflected back. By analysing what's reflected back we can offer improved diagnosis," he says. Professor Nick Stone from the Biophotonic Research Group at Gloucestershire Royal Hospital confirms the importance of this kind of diagnosis using lasers - a technique called raman spectroscopy. It's an area he's been working on for 13 years. "This will make a phenomenal difference, give us much more information about abnormal cells and significantly save money for the NHS because we can offer immediate treatment. "There's less risk to patients too because they don't have to go through unnecessary biopsies to find out whether the something's dangerous or not," he says. Scientists are also gaining an insight into how diseases develop and how cells react to disease, using a technique called laser imaging. In this process, individual molecules are dyed and then illuminated by lasers. 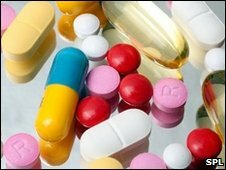 In the future, scientists say the knowledge gained from this technique will enable them to tailor drugs to a particular individual's needs. Personalised medicine, they predict, is guaranteed to be effective against an individual's cancer with minimal side-effects. "Light is a tremendous sensor," says Dr Kate Lancaster from the Rutherford Appleton Laboratory, which is home to the Central Laser Facility in Didcot. She enthuses about another new development, laser tweezers, and their future applications in laboratories. These minute tweezers, made up of two laser beams, can hold and move microscopic particles allowing medical experts to isolate individual cells. "Lasers may also provide a cheaper way of accelerating particles," says Dr Lancaster. This technology has the potential to reduce the size of conventional accelerators so that they fit on a laboratory bench-top. These potentially portable machines would offer a host of medical applications, including cancer therapy. As long as technology keeps developing, lasers will continue to be a vital part of medicine for many years to come.